Monokaki literally means thing(s) write, if you break the name up into the foundation parts. As a name of a notebook I think it is very apt. Monokaki is an A5 size notebook that comes in the lined format. It has 160 pages of fountain pen friendly paper. I’ve purchased this notebook a while back from Straits Pen for SGD$15. It is also available in B5 and B6 sizes, lined or blank. Straits Pen only carry the A5 lined option. 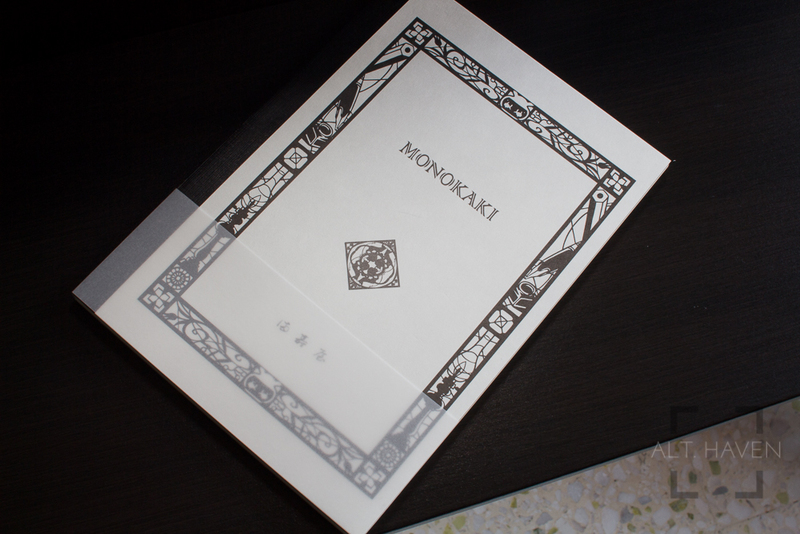 Monokaki comes with a white cover that’s has pencils, fountain pens and ink wells motifs lining the border. It gives me great hope for the notebook. The acid free light cream coloured paper is stitched bound and glued in sections. I found no feathering or bleed through even when putting it through its paces with a 1.5mm nib. Show through can be obvious depending on the colour of ink you use because of the thickness of the paper. The lines are printed a grey blue that’s neither distracting nor hard to see. The spacing between lines is a wide 9mm. It is wider than what I am used to. Monokaki lies flat for the most part once the spine is broken in. Immediately after the cover is a dark blue card stock that’s thicker than the cream paper. This thicker card stock is glued to the cover on the inside edges, when you open the notebook you can feel the two different paper curving at different degrees. I would have much rather the cover and the thicker paper to be completely glued together. However, this is just a minor nitpick though for this impressive notebook by Masuya Paper. The paper has a better dry time and is less crinckly than the fabled Tomoe River paper but offers a similar performance in terms of its ability to handle wet fountain pens.